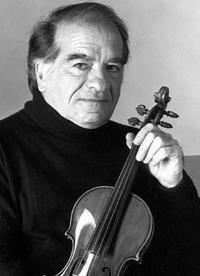 August 6, 2012, 8:49 AM · Legendary violinist Ruggiero Ricci had died at the age 94, according to The Strad magazine. Ricci began playing the violin at age six, with Louis Persinger. Later teachers included Michel Piastro, Paul Stassevitch and Georg Kulenkampf. A prodigy --whose parents lied about his age -- he performed to great acclaim all over the world. He then had to re-invent himself as he continued to perform as an adult artist. He taught extensively, with posts at Indiana University, Juilliard and the University of Michigan at Ann Arbor. He continued to teach into his 90s, giving master classes and teaching from his home in Palm Springs, California. He also wrote the book Ricci on Glissando, describing techniques that helped him to successfully play all the Paganini Caprices, for which he was famous for recording in 1947 on Paganini's own Guarneri, the Cannone. We welcome your comments and remembrances. August 6, 2012 at 04:11 PM · The first time I ever heard Paganini was with Mr. Ricci. It was unbelievable. I never heard anything play so fast. I'll never forget how exciting it was to hear those pieces. Rest in Peace. August 6, 2012 at 04:40 PM · I remember playing with him when I was 12 years old at a music camp in Brevard, North Carolina in 1976. He was a visiting artist playing the Tchaikovsky violin concerto, and I was just hiding at the back of the first violins. I just remember being so impressed by his commanding presence and his impassioned playing. I also remember he had a kind smile when he signed his autograph for me. A fond and gentle memory from my youth, I'm sorry to hear of his passing. August 6, 2012 at 05:19 PM · He was always known for his Paganini, but he was one of the most beatiful singers with the violin also! His book about violin technique is also remarkable. Sad, that he passed away. It feels like now only Gitlis is left from the old greats. May he live long! August 6, 2012 at 06:53 PM · When his parents first came to the USA from Italy they changed his name as a child to Roger Rich. However by the time he was eight or so and was becoming known as a prodigy his name changed back to Rugerio Ricci. He told a friend of mine a story that when he visited Heifetz at the time he was teaching and retired from playing, he was offered a glass of whiskey. To Ricci's disappointment Heifetz reached behind the single malts in the drinks cabinet and pulled out a cheap bottle of blended whiskey!! A sad but inevitable loss. His books are excellent and full of good advice. A great player. August 6, 2012 at 09:59 PM · A great loss...but what a wonderfully long and musical life to have lived. "You don't need to play so loud, it's not a trombone!" -after a bombastic performance of the third movement of the Brahms. "You can't even play a G Minor Scale in tune, how are you going to play this concerto?" -after a somewhat lacking performance of the first movement of Bruch G Minor. August 7, 2012 at 05:26 AM · Mention of the trombone reminds me of comments in his book "Ricci on Glissando." He was very much against shifts that looked like someone was playing the trombone and advocated the old way of creeping about the fingerboard and moving up and down on semitones rather than making huge or even small jumps. He believed in a careful left hand. But at the same time a pupil of his told me that he also liked people to "go for it."